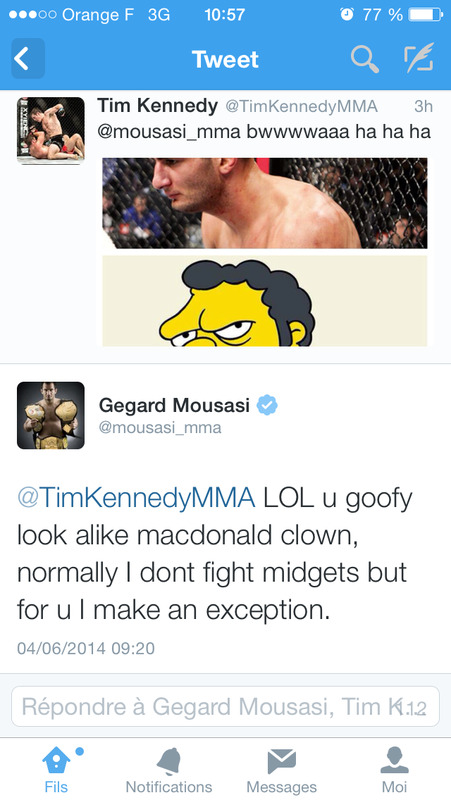 Mousasi and Kennedy going at it on Twitter ! Discussion in 'UFC Discussion' started by frandie2b, Jun 4, 2014. That's the first time I've seen Mousasi gotten to. Make the fight, Joe; we all want to know if Mousasi has improved his wrestling enough to be in the elite. I never seen Moose talking like this before. Does he mean Rory Macdonald? Dont compare gegard to moe as thats the only thing that will anger him. Duly noted. Has it come down to this? Stale kid jokes? Mousasi will wreck him though, so I would like to see this fight. Rofl! Moose letting it out. He's gonna whoop on Kennedy and I can't wait! Don't you just hate it when fights like these happen? Mousasi rendering this guy unconscious would make many people happy. Damn! Mousasi is down for the count. Can he get up after this? I'm pretty sure the Gegard tweet is photo shopped. does Jacare have a fight lined up yet?